The Donjoy SI Joint Belt is a comfortable low profile device designed to provide compression and help relieve pain around the sacrum region. Enjoy daily activities like walking or sitting. The SI Brace is a low-profile brace that provides compression and helps with pain relief around the sacrum area of the back and stability of the SI joint. Made with mesh material allows for plenty ventilation to keep cool. Since the SI Brace can be worn underneath clothing, the pulley system in the back allows for the user to tighten or loosen, finding the perfect fit. It also helps reduce strain on ligaments. Hassel-free, the anti-migration strips are to prevent slippage while wearing. The lacer design compression system is the unique feature of each BOA product. The system utilizes a multiple tear-drop channel design in conjunction with a high-tension harness cord and one simple pull strap to effectively tighten the orthosis with minimal exertion, strength, grasp and body motion by the patient. Sizing: Measure the widest part of your hip. Do you bill insurance? I have First Choice Health. Thank you for contacting Better Braces. We do not bill through insurance but we can help put you in touch with a Don Joy Representative in your area to see if your insurance will cover this brace. You can contact Product Support at 888-405-3251 to help get in touch with your local representative. The DONJOY SI belt is a low profile brace. It is about 5" tall and a half inch in thickness. Can I use this for my workout? I do heavyweight and normally all the pain is in the sacrum area. If not what is your recommendation? Thank you! I have degenerate bone disease in my spine, scoliosis between L5 and S1 two bulging disks between L5 - L4 and L4 - L3 con-caving in lumber on right side causing constant sciatica affecting my right leg and hip severely making standing, sitting or walking a nightmare. I use ice packs, heat pads, norcos back braces I feel like nothing works was considering trying that leg wrap that applies pressure to back of knee on my sciatic side but fear it will do nothing for all the hip, S1, and lumbar pain. Will this help me at all? 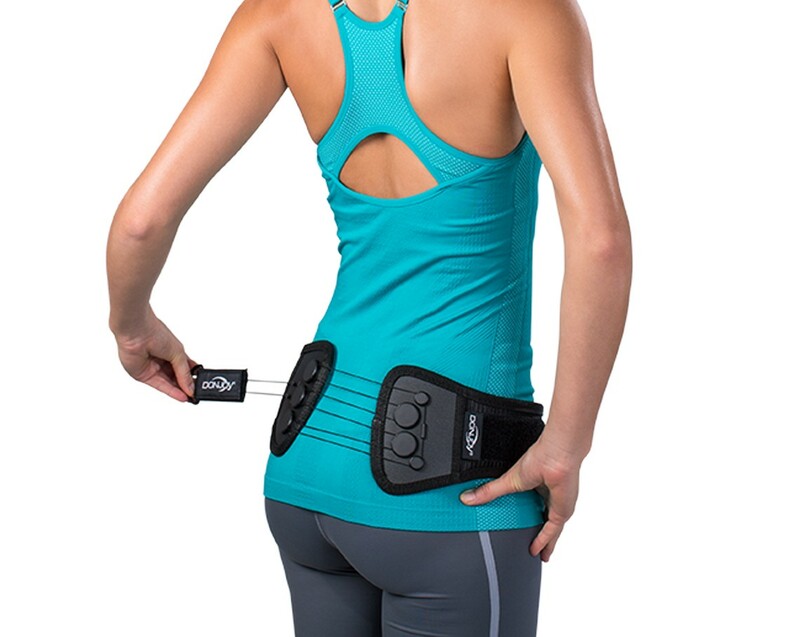 The SI belt is for discomfort over the SI joint, not sciatica. Sciatica comes from the lumbar spine so you would need a back brace for the lumbar spine, which it soulds like you have been using. I have severe deterioration of L4-S1, causing constant lower back pain that radiates down my left leg, with the most sever pain bein in the calf/upper ankle areas. I currently have a custom, rigid, LSO brace that is cumbersome and very uncomfortable, making it very difficult to comply with usage recommendations. Surgery is not an option at this time because of other conditions that would hinder recovery. I work mostly at a desk and need a comfortable brace that I can wear under my uniform (scrubs). Would this belt be appropriate? I have been to multiple specialists, and they all have differing views. Thanks. 1. Is there a photo available for he front of the belt, want to see how it fastens? 2. Is it made to be worn all of the time, just during the day, part time, at night? I am sorry we do not have a photo of the front of the SI belt. The belt attacheds at the front with velcro. You can wear the belt any time day or night although I would not suggest sleeping in it. Hi, I am a long distance runner and have had hip problems that ultimately led to SI problems. I have been told by multiple doctors that I am able to efficiently compete in sports and be active with this belt on, but whenever my hips flex when I stride or walk up the stairs, they gradually push the belt up to my stomach. Aside from that, the belt is extremely tight and I honestly do not enjoy wearing it at all. I simply feel like it is hindering my ability to remain active than help it. From my understanding I am wearing the belt correctly. From what I have heard, none of this should be happening to me. Do any of these problems I have mentioned suggest that I have been wearing the belt incorrectly? Thank you for your question. The DonJoy® SI Belt provides stabilization of the sacroiliac (SI) joint through direct compression. The silicone grip strips prevent the brace from migrating and "locks" the hips. How will this belt fit if you are not, um, skinny like the model wearing it in your picture? I mean the XL should fit me around but where the belt is place I have a few small rolls.. I don't have a flat stomach.. will it smoosh the rolls of fat down or sit on top of them?? Thank you! Thank you for contacting product support. The front of that belt is thin so most likely it will sit either above or below your belly. find a postion that is most comfortable for you and your body type. If you have any other questions please do not hesitate to contact us. I was wondering if the SI Belt low profile comes in a longer belt as I have limited strength in my hands and arms to pull the belt. The large belt I tried on at the PT office just barely fit over my clothes and I don't want to wear it under my clothes because I would have to buy new ones and this isn't affordable for me. Unfortunately, the SI belt is offered in only the two sized listed. Can the Donjoy be worn under any clothing and not be detected? Is there a store in Los Angeles where i could go to try out these sacroiliac supports? After months with no improvement, is this a lifelong injury? Would this SI Belt help with pain related to a prevoius L5-S1 spinal fusion? Yes, however you should see your doctor to confirm this is the product you need. Or with your zip code, we can identify a local representative who can meet with both you and your doctor to verify this is the product you need. Does the DonJoy SI Belt have velcro fasteners to open and close the belt? The DonJoy SI Belt does have a Velcro type fasteners to hold the belt closed. I bought this back brace to reduce some SI problems I have when playing golf. It works very well. Like most DonJoy products the functionality is outstanding. I do have a comment: I like to wear this under my shorts/pants but the product is a bit thick and the D ring definitely sticks out and forms a bulge. I would have given it 5 stars otherwise. Reduce the thickness and come up with something other than a D ring and this is a winner. I had originally bought the Breg Boa, on recommendation from my doctor. I liked it very much, however the draw string pulley system broke after a few months. They replaced it--and the same thing happened again. I then found the DonJoy SI Belt and have loved it. I have had this one for nearly 3 years. I wear it golfing and for tennis. I only wish it was a bit thinner, but that is likely why it has lasted so long. Great product for true SI joint dysfunction. I received this about 3weeks ago in the mail and I love this back brace. It is so comfortable. I can bend over move side to side without pain in my back! I had another company send me one before this one and it was huge so tall and I could do nothing in it! It did not work! I am so glad to get the Don Joy SI back brace! THANK YOU! Great brace, helps me make it through the work day. I just wish I would have ordered a medium instead of a large. I am 5'9" and 165 pounds, my hips measured for a large but it overlaps the silicone grips completely due to the size. Cons: -Tends to move up when sitting for over 30 minutes (i.e., riding in a car, sitting at lunch or in a movie, etc.) regardless of firmly the fit is before embarking on any of these activities -The tab at the end of the pull that tightens the belt does not lay flat and as a result it shows when wearing certain clothes. Immediately stabilized a painful SI joint and provided pain relief. This brace was physician recommended for diagnosing a possible "loose" SI joint and the immediate effect was not only diagnostic but relieved left buttock pain. Pros: Easy to use and disappears under dark clothes. Cons: Only one color. A neutral tone would be more invisible under light colored clothes. I injured my SI joint and irritated my lower bulging discs. I had a dressage competition coming up and I was not able to do a sitting trot on my horse. I bought this brace its amazing it fit perfect on my bare skin under my riding pants. It stays in place while I'm riding and allows me to achieve the goals I need. My riding improved the moment i put it on. It also helps me when I'm lifting heavy stuff. I can wear it under or over my clothes. When we went on vacation, and we were flying I wore it in the airport. Toting my carry on all over Atlanta airport just kills me. I was able enjoy our vacation. I like the feature of making it tighter if you need it. It's a little bulky and the tab sticks out a little, but the support it gives is amazing. Thinking about getting another one.. I was very unsure about an SI specific brace, and was unsure of which price level to pick. I have had great results! The arthritis in my SI joints is less painful when I use this brace, it fits comfortably like a firm hug around my hips, and has increased the time I can stand before I am fatigued. It could be improved with instructions on how to position it on your body. Better for me then weight lifting belts that are difficult to adjust and harder to place in the intended area. Can be easily adjusted while wearing so i wear it through my entire workout! Pros: It is easy to tighten as well as loosen so you can wear it through out your entire activity.....so in between lifts you can adjust for comfort simply with the velcro ring.